The opening scene to this story is one of the most credibility-stretching premises we've seen for some time. 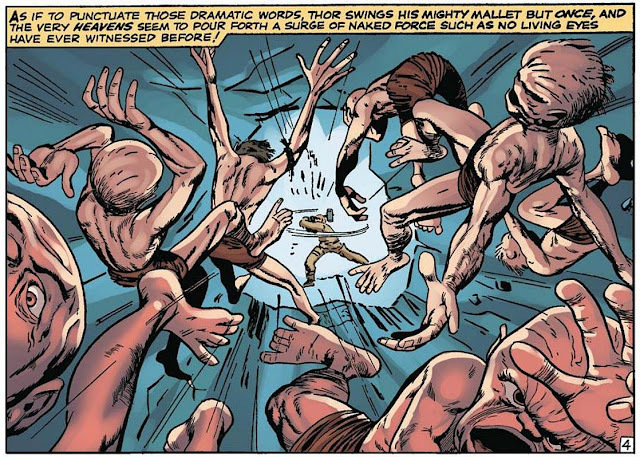 The splash page shows Thor on the streets of New York City, smashing his hammer into the pavement in front of a score of onlookers and causing an untold amount of city damage. Why? It seems he had just been flying over NYC when he spied an out-of-control truck about to hit a boy playing in the street. Knowing that he could never reach the scene in time, he instead flew to the ground and slammed his hammer down, sending out shock waves in one controlled direction, which reverberates through miles of the city (causing how much more damage along the way?) until it reaches the desired spot, 1.2 seconds later - at which point it causes the truck to leap into the air, and thus bounce over the terrified child in question! This comic should have come with a health warning, as the unparalleled degree of eye-rolling evinced could very likely lead to ocular damage ... and yet the opening is entirely appropriate too. After all, yes, that scene is in one sense ludicrous - but in another, it's a way of declaring what kind of story this is: A melodrama, with stakes and situations we can understand, but raised to operatic proportions. And for a comic book story starring a thunder god, isn't that exactly right? Thor's getting a little cavalier with those emergency funds! As seen on the cover, this issue guest-stars Lee & Ditko's sorcerer supreme, Dr. Strange. And it's worth noting that Dr. Strange appearing in Thor's comic feels right in a way that doesn't necessarily hold true in other books, as they're both heroes that come from a foundation of mysticism and lore. (Compare this, for instance, to the slightly mismatched feeling when the magical Strange guest-starred in the super-scientific world of the Fantastic Four!) 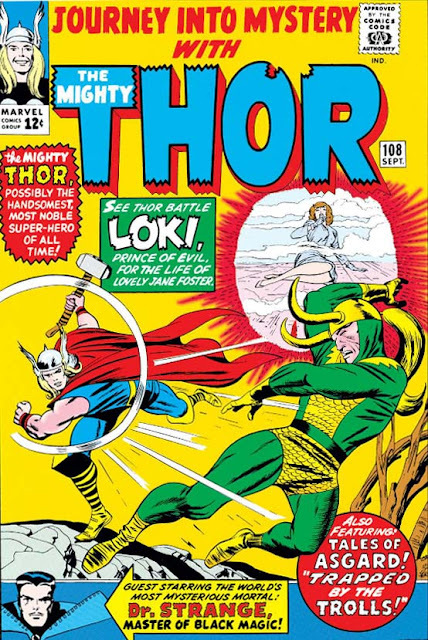 Interestingly, Strange summons Thor from afar to where he has collapsed in his home, entirely spent after defending the city from his archenemy Baron Mordo - which has the unusual effect of making it almost seem as if Thor is the guest-star, suddenly popping into a Dr. Strange adventure already in progress! Was this Stan thinking on the standard storytelling tropes, and purposely inverting a formula that he was consciously aware of? Or was this simply a matter of him striking gold while winging it - as usual? The Doc after an all-night bender. that sends them all flying back, and not the blow itself. 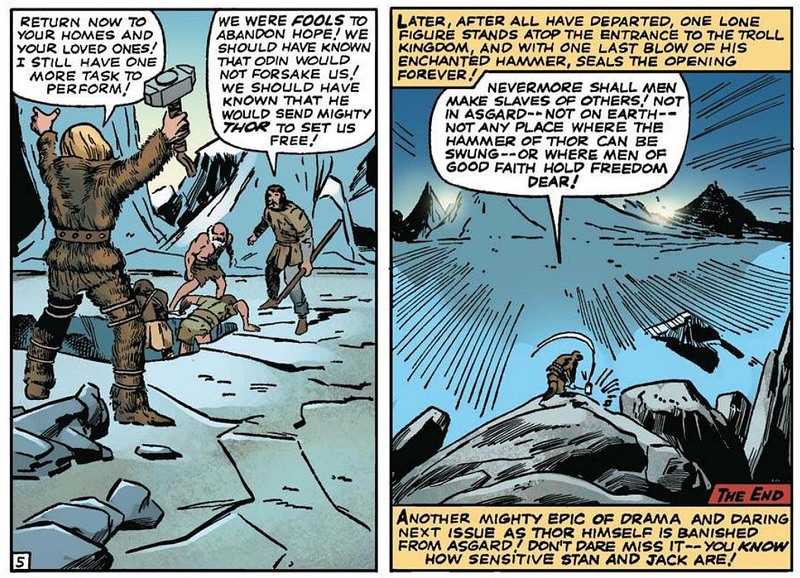 In a similar vein, this month's "Tales of Asgard" feature is but a short vignette telling one of the exploits of the young Thor - as opposed to the recent Tales we've had filling in the background on the other Asgardians. It came to pass that Sindri, king of the dwarves, had been sending Asgardian captives to the trolls, as part of a terrible pact to keep them from attacking his kingdom. 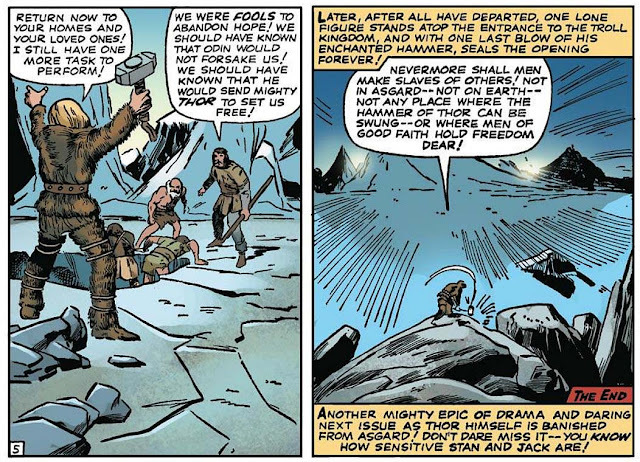 Accordingly, a disguised Thor gets himself captured and sent off, then leads the Asgardian prisoners in revolt and ultimately seals away the land of the Trolls. It's a very simple story (even by TOA standards) - but even if it doesn't have the mythic resonance that most of these instalments usually do, it still does a decent job of illustrating more of the Asgardian lands than we've seen to date, and the relationships between the people and monsters therein.